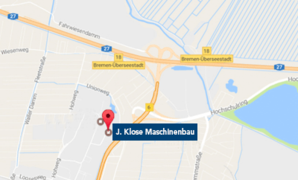 J. Klose Maschinenbau GmbH & Co.KG was founded in 2015 as an independent competence centre, which could optimally combine the provision of advice, sales and services relating to our JKM PreciCut fine grinding machines. 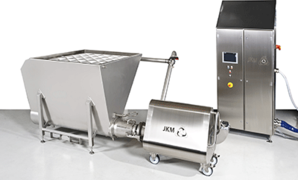 Thanks to the modularly-designed cutting system, JKM PreciCut machines are universally applicable, but they are also special machines that meet the highest hygienic and energy-efficient requirements for each application. With a broad spectrum of construction types, the JKM fine crusher meets a wide range of requirements in several areas of the food and non-food industries, with innovative high product quality and quantity, and ensures cost-effective production due to low operating and maintenance costs. The homogeneous fine grinding and emulsification of fine sausage meat, liver sausage, rinds and other meat products is as easy as the production of paste-like masses using fish, fruit, vegetables, nuts or dairy products. The fast, uniform and product-friendly melting and grinding of chocolate – with or without ingredients and toppings – is also possible in large quantities and to a high degree of fineness. The rework of different (part-prepared) finished products can be integrated into the production through homogenisation and fine grinding. Our PreciCut machines can also be used to disperse dry substances in liquids, or to crush wafers and biscuits. Likewise, in the cosmetics and pharmaceutical industries, production processes are significantly shortened and there is considerably less tool wear if our machines are used. In addition, it always presents new application possibilities. Our innovative cutting and grinding system works in accordance with the rotor-stator principle, with optional perforated sheets and wing blades, as well as various turbo chargers and other product-specific, high-performance tools. Thanks to the use of different tool combinations, the degree of fineness and the product temperature can be set individually. The patented non-contact cutting system guarantees consistent product quality, with a uniform particle size of 40µm – 3 mm. Metal abrasion can therefore be avoided, and tool wear is reduced by up to 70%. The product is specifically guided through this cutting system so that it is homogeneously crushed with very low airflow, and finely emulsified, before leaving the machine. Production volumes ranging from small batches below 100 kg/h, to large quantities exceeding 20 t/h, can be processed.